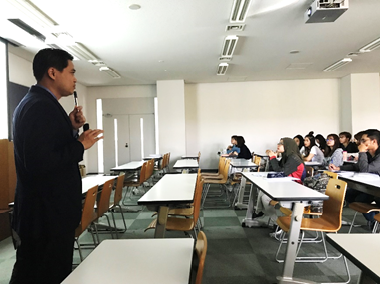 Mr. Vathouniyom Douangmala, Director of the Tourism and Exchange Division of the ASEAN-Japan Centre gave a lecture at the Sagamihara Campus, Aoyama Gakuin University on June 18, 2018, in response to a request by the University. It was the third time for Mr. Vathouniyom to give a lecture at this campus; and it was attended by more than 50 students who enrolled in a class on “Tourism in Asia”. In his lecture titled “Tourism Policies in ASEAN -its contribution to AEC-“, Mr. Vathouniyom elaborated on history and features of ASEAN, ASEAN Economic Community (AEC) as a highly competitive economic region and the ASEAN Tourism Strategic Plan 2016-2025. He also briefed the students on the AJC’s activities to promote tourism as well as exchanges of persons between the ASEAN Member States and Japan; and shared attractions of Lao PDR, his home country, with the students. The lecture well-inspired the students as Mr. Vathouniyom received many insightful comments and questions from them, including why number of tourists from the ASEAN Member States to Japan has been increasing; what Japan should do to attract more tourists from Southeast Asia; and what are differences in attraction of Vientiane, the capital, and Luang Phrabang, an ancient capital and popular tourism destination in Lao PDR.